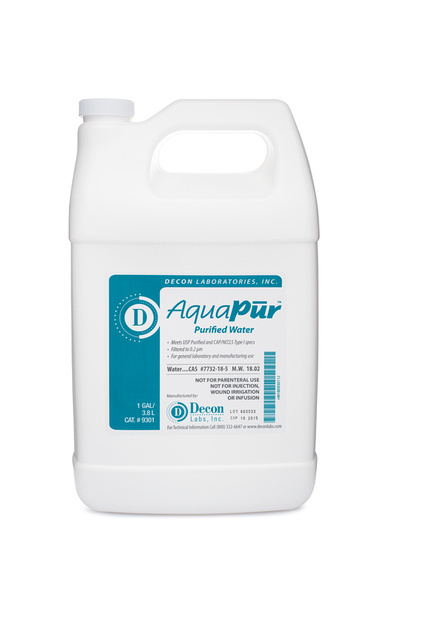 AquaPur™ Purified Water meets USP and multi-compendial specification, made for applications requiring USP/EP grade Purified Water. Made via deionization, reverse osmosis, UV treatment, and ultrafiltration, AquaPur meets specification including microbial specification through its 2 yr shelf life. Packaged in gallon, 5 gallon, and 55 gallon configurations. Not for parenteral use. Not for injection, wound irrigation or infusion.